ASTANA – The Chamber Choir of the State Academic Philharmonic of the Astana Akimat (city administration) will perform worldwide hits from rock operas and musicals Nov. 27 in Astana Opera. In the last few years, rock hits performed by local orchestras have been well received in Astana’s concert halls. The rock opera as a genre dates back to the 1960s. It is still an opera that narrates a story, but the plot is revealed through vocal compositions written in the rock style. In addition, guitarists and other rock musicians can be onstage along with vocalists. The choir will sing popular compositions from rock operas such as “Jesus Christ Superstar” by Andrew Lloyd Webber, “Mozart, l’Opéra Rock” based on a book by Dove Attia and François Chouquet, “Juno and Avos” by Alexey Rybnikov, as well as the songs “Bohemian Rhapsody” by Queen, “Stand by Me” by Ben King, “Ain’t Now,” “We Shall Overcome” and others. The performance will also include pieces from musicals recognised worldwide. Musicals, being drastically different from the classical operatic vocals, are done with a unique combination of musical, dramatic, choreographic and operatic art. The concert programme features the song “Araily Astana” by Kazakh composer Zholaman Tursynbayev and hits from the musicals “My Fair Lady” by Frederick Loewe, “West Side Story” by Leonard Bernstein, “Chicago” by John Kander, “Rent” by Jonathan Larson, “Mamma Mia!” by Björn Ulvaeus and Benny Andersson from ABBA, as well as “Roméo et Juliette: de la Haine à l’Amour” by G. Presgurvic, “Notre-Dame de Paris” by R. Cocciante and many others. 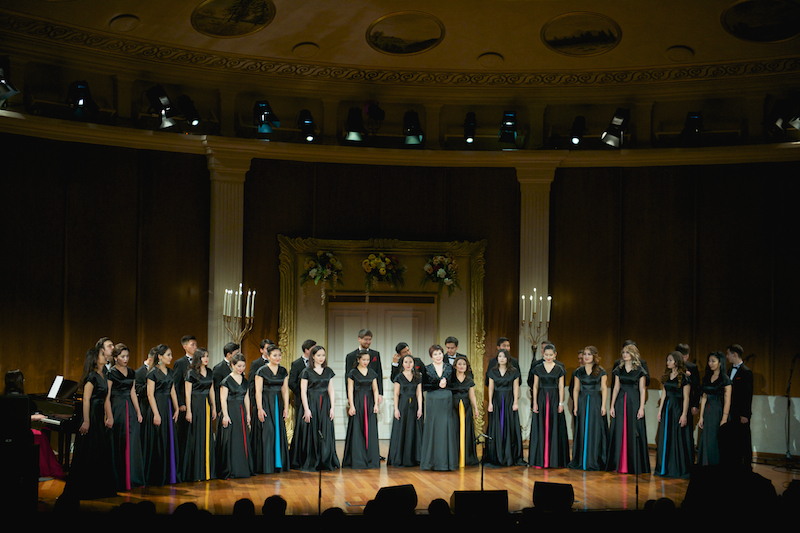 The Chamber Choir of the State Academic Philharmonic of the Astana Akimat under the direction of honorary artists of Kazakhstan Gulmira Kuttybadamova form a team that has repeatedly won awards at several international competitions and toured many cities across Kazakhstan and abroad.